I'm reading. I always read the newspaper, The Houston Chronicle. How I still miss the long-gone Houston Post. Oh, how I miss the Chronicle from the time when it was a real newspaper instead of a mournful shadow of itself. The mail periodically brings, well, periodicals: The Economist, Reader's Digest, National Geographic, Consumer Reports, Texas Highways, Texas Parks and Wildlife, a plethora of home decorating mags, and the public relations publications of Adubon Society, Houston Zoo, Houston Museum of Natural Science, Nature Conservancy and para-church pubs. And, of course, I seldom miss my daily devotions. "Of course," just as my great grandmother, Mama Calahan, said to my sister and me, "Of course, I know you girls completed your morning devotions long ago, but Mrs. M_ and I enjoyed a late start to our morning and hoped you wouldn't mind joining us for ours. It's so nice to have good, young voices to read and sing for us." Jowett, John Henry: My Daily Meditation for the Circling Year. New York Chicago: Fleming H. Revell Company, 1924. Project Gutenberg. Kindle. Each day's reading is a short commentary on a scripture reference which I'm incongruously reading in the Amplified Bible, the Lockman Foundation's Kindle edition. 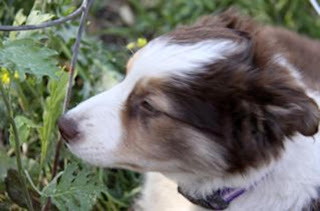 Lady Bird, the border collie puppy, came to visit on Good Friday and went home on April 30th. She grew from a 12-week old puppy (terrible two's in human years) to almost 16-weeks (a tweenager) and was either terribly sweet or horrid most of the time. It was an experience for all of us. Her last couple of days were near perfect. 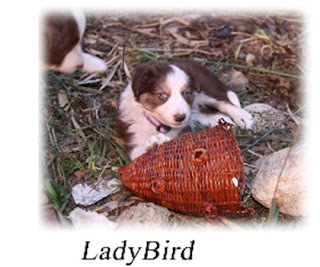 Mandy was willing to play with the pup and it was fun to watch them play herding games but I'm the only one who misses her at all. Mandy's reaction was to show me the kennel and ask if she could have the uneaten puppy chow. Cathey had a lovely trip to Ireland and I can tell I'm going to have to follow in her footsteps one day. 18th & 19th Century British Women Writers Assoc. copyright by K Cummings Pipes. Simple theme. Powered by Blogger.